Rarely in the church’s history has pastoral ministry been more demanding. While seasoned pastors face challenges—political divisiveness, declining numbers, increasing demands—at degrees they’ve never experienced before, younger pastors often find themselves diminished or discouraged by a bewildering world of demands. Ministers young and old may liken this intense climate to a crucible where, every day, we find ourselves at risk of being melted down by the pressures of our vocation. Yet, rarely in the church’s history has pastoral ministry been more thrilling. The Word of God today is still living and active, even explosive, with power to spark new visions and kindle new dreams. 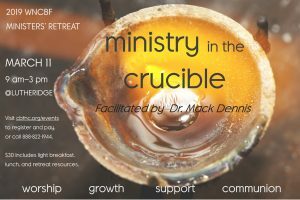 This conference will invite us to remember the fiery elements of our sacred vocation, and consider the crucible of ministry as a setting for radical reformation and new creation. Together we’ll engage the Scriptures, contend with challenging contexts, find inspiration in ancient and contemporary expressions of bold Christian witness, and leave with more light for our respective paths. Scholarships are available…call Gail Coulter at 828-698-2385 to request. Directions: From I-26, take the Airport Road exit and drive east. Turn right onto Hwy 25. Lutheridge is shortly on the right. We are in the building on the right named “Mission”. Please do not park on the grass. You can go up behind the building and park near the chapel. 12:00 Lunch with free time for conversation or silence. A labyrinth and trails are nearby.